Yesterday I received the best thing I have so far been sent to review - a really amazing pan. I know this isn't the coolest statement ever uttered, but I was genuinely really excited because I have been looking for a great alternative to traditional non-stick pans for a couple of years and the Ozeri Stainless Steel Earth Pan is THE ONE. Twenty or so years ago, when I was a kid, my parents twigged to the idea that cooking food in aluminium pans could release aluminium into your food, with the associated health risks that were just beginning to be reported, such as a potential link with Alzheimer's disease. With two young kids in the house my folks decided it wasn't worth the risk and ditched the aluminium in favour of stainless steel. With my own family I have always used stainless steel pans, but we also had non-stick coated frying pans. These got pretty bashed up and scratched and I was concerned that some of the non-stick coating that was disappearing from the surface of the pans might be ending up in our food. I started to hear suggestions that this coating was a potential carcinogen, and although I'm not one for jumping on the media scare band-wagon, this particular one sounded all too likely, so out went the non-sticks and in came the regular run ins with burnt on food. This is kind of ironic since burnt food also contains carcinogens. The opportunity to review one of the new generation of non-stick pans therefore came as a real delight. These pans are manufactured by Ozeri, an American company that supplies luxury holiday homes with items such as top of the range pans and kitchen scales. The company is so chic it doesn't even advertise, relying instead on customers using the products when on holiday and not being able to live without them when they get home. 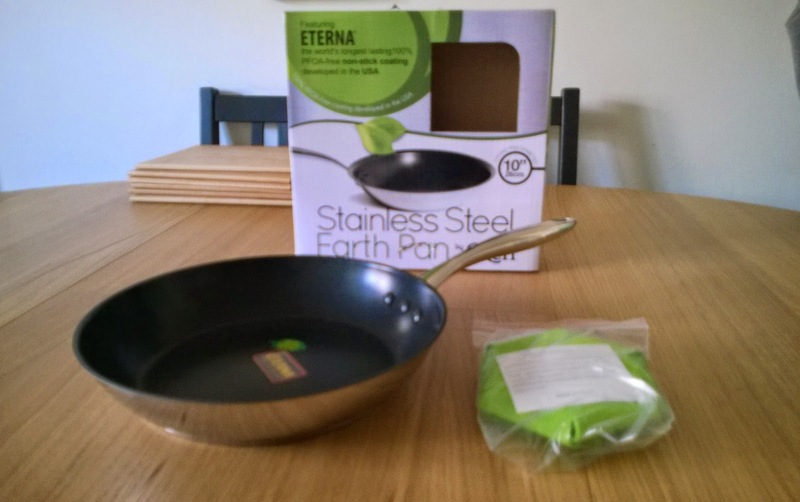 The pan I was sent features Eterna 'the world's longest lasting 100% PFOA-free non-stick coating developed in the USA'. With a few simple care instructions, including a cute little blanket to put it to bed with so it doesn't get scratched when stacked with other pans, this product has a lifetime guarantee. The pan feels good quality, a nice weight, comfortable balanced hold and I'm looking forward to trying out the hob-to-oven feature that will make frittatas really easy. I had been mulling over a few ideas for how to really road test the pan while I was waiting for it to be delivered. 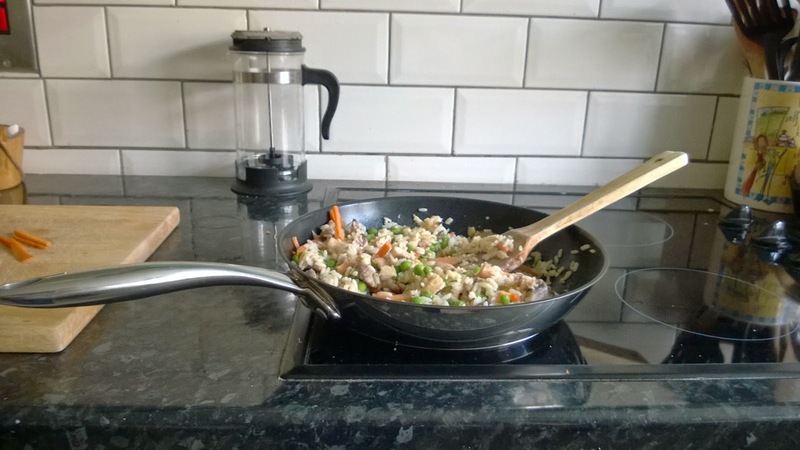 My final conclusion was that my special egg fried rice was the meal that was certain to stick and burn in every other pan I have ever owned. 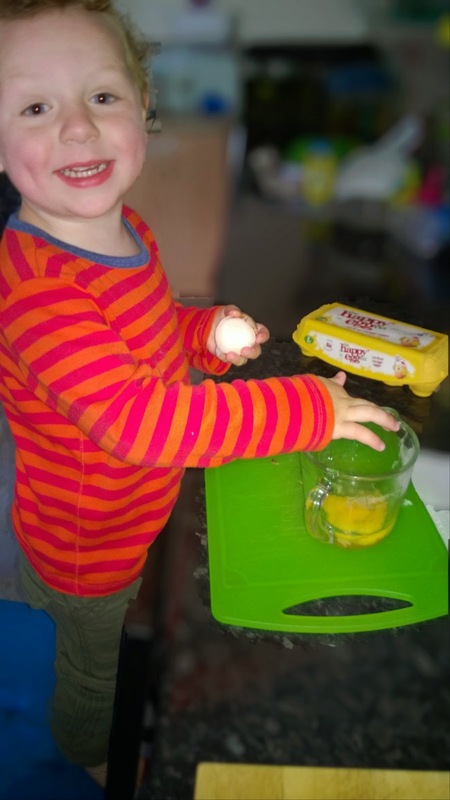 Special egg fried rice is one of Toby's favourite meals to help with because it means he gets to break some eggs. Usually more eggs than are actually needed because he loves it so much. 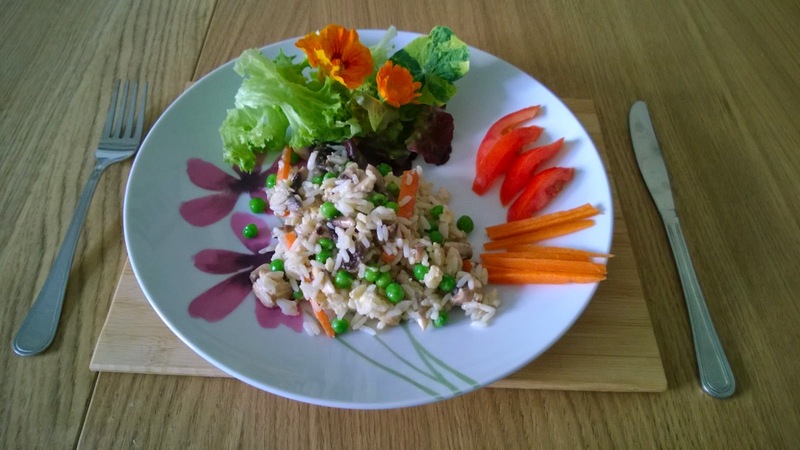 My rice recipe also contains mushrooms, so lots of fun chopping for him, plus anything else that needs using up (hence why it's 'special'). It's very simple: cook rice, let the rice cool and dry out a bit. Whisk up eggs. Add rice and egg to a frying pan and cook over a medium heat. When the egg starts to cook, add in anything else that needs using up, season, add a little soy sauce and jobs a good 'un. Then serve with a nice seasonal salad (with edible flowers if you have them) and enjoy.... followed by soaking the pan, boiling vinegar in it and cussing it gently as I scrub it late into the night. Not this time - the new pan actually lived up to the hype and nothing stuck to it, nothing burned and the pan ended up coming off the hob looking like new. Hubby Matt was so awed he even put it to bed in a cupboard with it's blanket on instead of wedging it under a stack of other pans on the shelf. As to the meal, clean plates and not too much on the floor, so definitely a success. Ollie and Toby especially liked the lack of black bits in the rice, and were definitely more adventurous in eating the nasturtiums and marigolds in the salad than their daddy was.